David is a working violinist throughout the Greater Tampa bay area. He studied violin with Dr.Carolyn Stuart at the University of South Florida. 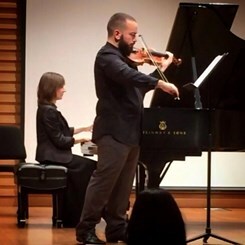 He has performed with numerous orchestras, pit orchestras, chamber ensembles and currently is a violinist at the Imperial Symphony Orchestra in Lakeland Florida. He has studied at the Green Mountain Chamber Music Festival in Burlington Vermont, and has performed in multiple world premiers, concerto competition finalist concerts and music theatre and opera performances throughout the US. He has over 20 years of experience playing the violin and has recently celebrated his first decade of violin teaching.